I had no idea Moab, Utah was atomic. Dummy me, I just thought it was a famous place to enjoy the outdoors. This little town of 4,800 people in the Colorado plateau just south of the Colorado River is a mecca for outdoor enthusiasts. 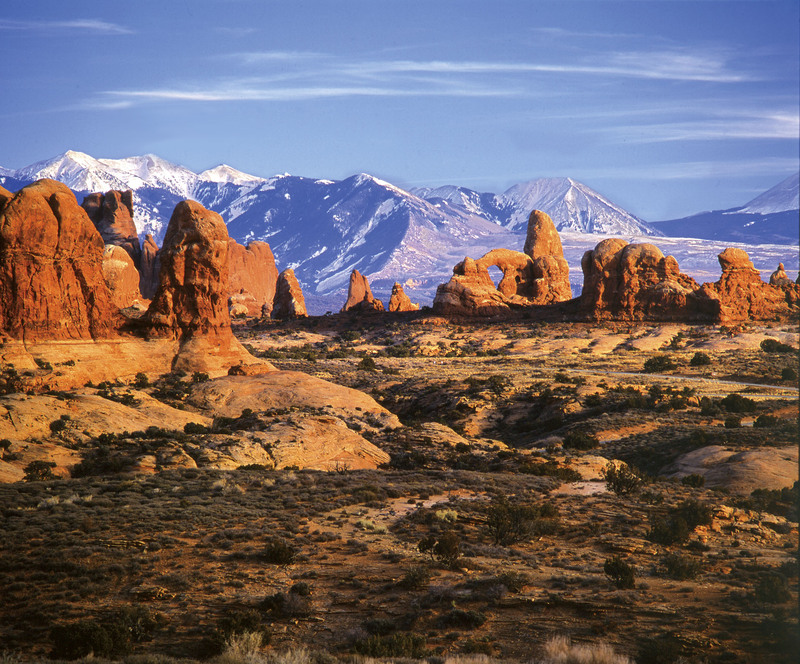 They flock there by the thousands to ride mountain bikes on the famous Slickrock trail, ride off-road in the annual Jeep Safari and visit two nearby National parks. Indiana Jones and the Last Crusade was filmed here, as were scenes from Thelma & Louse, City Slickers, Mission Impossible and a bunch of other movies. There’s a real naturist vibe within this little town nestled among striking red rock canyon walls. People get up early, play hard and relax even harder at places like the Moab Brewery. 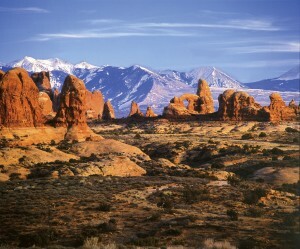 Being there today, it’s hard to believe Moab was – not very long ago – the uranium capital of the world. In the 1950’s, it boomed to nearly twice its population, boasting restaurants like the Atomic Grill and Uranium Cafe. This alignment began changing once the cold war ended, but as recently as 2002 the town petitioned President Bush to change the name of its “Massive Ordnance Air Blast Bomb (M.O.A.B.). This 21,000 pound non-nuclear “mother of all bombs,” (still called MOAB as recently as 2007) didn’t help the town’s outdoor adventurist branding. 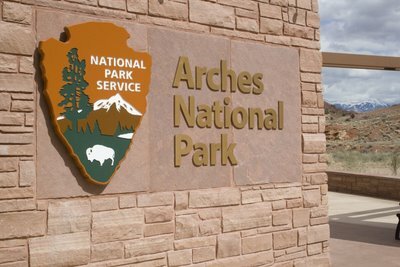 While this atomic history has faded away, it came to life eerily as I drove the four miles from Moab to Arches National Park a few weeks ago. Almost literally across the street from the entrance to one of America’s most famous parks, you see trucks hauling dirt on a giant pile along the banks of the Colorado River. To the un-expecting tourist who hasn’t done his research (me), it looks like some kind of massive strip-mining operation. Turns out this eye-opener is one of the biggest winners of federal environmental cleanup contracts under President Barack Obama’s stimulus program. The “pile” – nearly 130 acres – is made up of mill tailings and contaminated tailings materials left over from the uranium-ore processing between 1956-1984 by the Atlas Minerals Corporation. The tailings were sending a radioactive plume of groundwater seepage also polluted with ammonia toward the river. Now owned by the DOE, the clean-up site has created 121 jobs for people shipping the radioactive waste away to a specially designed location 30 miles north. About 6,000 tons are being hauled away each day by train. Uh, sounds like spin to me, but I hope it’s not. I didn’t feel better reading that site operations are shut down at sustained wind speeds of 25 miles per hour or greater. The day I visited Arches it was very windy but the trucks were still doing their thing. Maybe they were only 21 mph winds. I also wasn’t thrilled to hear that a truck carrying uranium mill tailings tipped over and spilled some of its radioactive dirt in October. What a case study for the beauty of nature vs. the dark side of man. I hope the former wins out. All good people support renewable energy, right? As the country gets serious about solar, wind and other renewables, and the government steps in with subsidies, parties that traditionally fell in line on eco issues are increasingly squaring off. Rural Nevada got a shocker when it learned that two large solar farms, in addition to creating hundreds of jobs, would need 1.3 billion gallons of water per year, or about 20 percent of the desert valley’s supply (via New York Times). Water plays a different role in Cape Wind off Massachusetts, potentially the country’s first offshore wind farm, which last week was threatened by a move to place Nantucket Sound on the National Register of Historic Places. “The identity and culture of the indigenous Wampanoag (Native Americans) are inextricably linked to Nantucket Sound,” according to a Massachusetts Historical Commission opinion. Cash for Clunkers or ‘Pimp My Pickup’? The most common trade under the $3 billion Cash for Clunkers program involved Ford F150 pickup truck owners trading for, well, new Ford F150s, netting an improvement of just 1 to 3 mpg, the Associated Press is reporting. That trade happened 8,200 times. Thousands of other pickup owners used our tax dollars their clunker cash on new Chevy Silverados and Dodge Rams. Worse, more than half a million dollars in rebates somehow went for autos that got equal or lesser mileage. The government is investigating. If you got $3,500 to $4,500 for your new rig, you probably don’t disagree. Great things can come from rebuilding after a disaster. Rebuilding downtown Chicago after the 1871 fire started the era of high-rise construction. The great urban spaces of Boston, San Francisco, and even Cleanspeak’s hometown of Portsmouth, New Hampshire, arose from fires and earthquakes. They ushered in innovations like brick construction and firewalls to keep blazes from spreading, new sanitation systems, parks and squares. 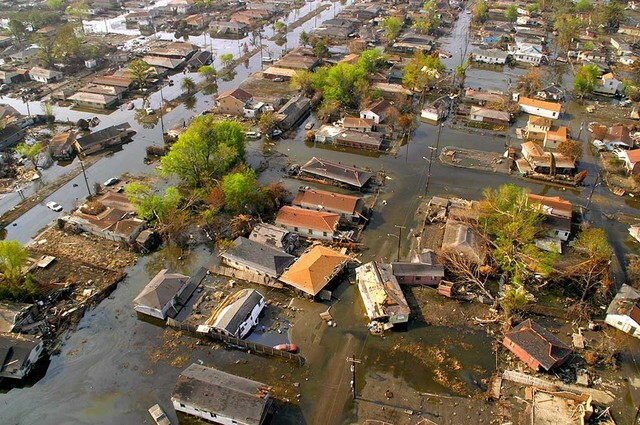 Today’s sustainable development advocates view post-Katrina New Orleans as the Chicago or San Francisco of large-scale sustainable development. New Orleans is a unique laboratory for developing technologies, construction methods, business practices and government policies for re-building communities sustainably, goes the green thinking. It’s like what happened in Greenburg, Kansas, which rebuilt itself sustainably after a 2007 tornado destroyed the town, but on a larger scale. A forum in New Orleans, next week, “The Green Rebuilding of New Orleans Conference,” is one of many attempts over the last four years to chart a sustainable course for the city’s future. Organizations like The Holy Cross Project have already begun building sustainable housing in damaged areas. I want to jump on the advocates’ side because I’m a sustainable building freak, not to mention an architecture nerd. I’m just not sure that New Orleans and sustainable development are synonymous. Even if every newly constructed building in New Orleans is LEED certified, built from recovered materials and blessed by Pope Al Gore himself, it won’t be sustainable development because of the larger realities about New Orleans. Can it be sustainable to rebuild vast areas of a city that lies mostly below sea level when scientists say the seas are rising and weather patterns are growing more extreme? A city in a bowl bracketed by a large lake and the mouth of the Mississippi River? 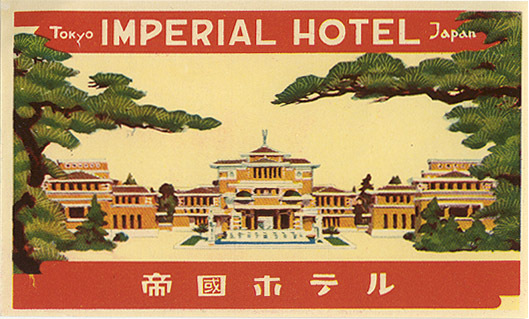 A city that has flooded disastrously twice in the last 100 years? A city that needs 148 pumps working continuously to keep it from filing up with water? Let’s face it, if anyone proposed building a city in a spot like New Orleans today, they’d be tasered and put under guardianship for their own safety. The Mississippi and the Gulf of Mexico are a levee break or a pump failure from reclaiming the city. How much effort and how many resources are wasted when new construction is wiped out by the next catastrophic storm? So if sustainability was the only consideration in re-developing the damaged parts of New Orleans, then it would be hard to argue the pro-redevelopment position. There are, however, cultural, moral and social justice issues that weigh in redevelopment decisions. The hardest hit sections of the city were largely low income. Is it morally acceptable for governments to withhold reconstruction aid in those areas because the long-term prospects are uncertain? 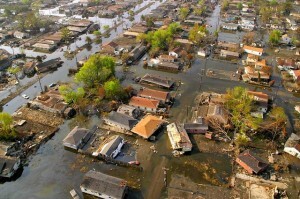 Flooding destroyed several government low-income housing developments. Is the government morally obligated to rebuild them? Can private lenders be compelled to approve mortgages for new homes in flood-damaged areas when Katrina showed how vulnerable they can be? The engineers and architects who rebuild New Orleans have to apply that kind of thinking to the city’s realities. Maybe New Orleanians will ride out the next flood in homes that can float on the floodwaters, then settle back into their foundations when the waters recede. Who knows. The point is that sustainability, in this case, must also include survivability. 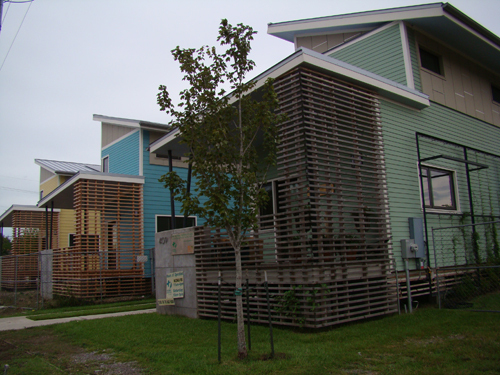 There’s no doubt New Orleans offers a unique opportunity to develop sustainable building designs and methods. Attention to surviving the city’s unique, if not hazardous water-bracketed topography will help ensure what rises in New Orleans to replace what Katrina destroyed will be a fitting living monument to the lives lost there, and a testament to American’s talent for wringing progress from disaster.